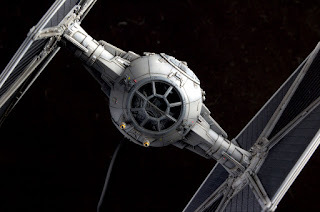 One of the recently release Bandai Star Wars kits. Model is finished in Tamiya and Vallejo acrylics along with MiG enamels. Flight stand is brass tube bent to shape. Very cool. Are you planning on painting any of the Star Wars - Imperial Assault models? Yes! Unfortunately, they are at the end of a rather long list of projects I have (some more space marines, a small Warhammer army, a couple more X-wing Miniatures ships, a 1/700 USS Saipan, and a small collection of Bandai Star Wars models) so I cannot say when I'll actually get around to getting them done but I'm getting tired of playing the game with bare plastic! I saw the box for them in the store and then remembered that I have something like 100+ models and the Secret Weapons Tablescapes, plus terrain and other stuff to paint, then sadly put the box back on the shelf. Hello. I'm a new / novice modeler. If you don't mind can you describe how you purchase, create and attach the brass rod to the stand and model? Is it glued in? Maybe just has a snug fit? I'd like to replicate your approach as it looks great. The brass tube is from Hobby Lobby and they sell two different types: bendable and non-bendable. This is the bendable type and I bought it in a three pack of various sizes. It's attached to the base through the rectangular plug that is supplied with the kit (the plug is to cover the attachment point for the display arm that comes with the kit). I drilled a hole in the plug slightly smaller than the size of the tube. I secured it with a two-part hard set epoxy (I bought from the hardware store). I drilled a hole in the bottom of the TIE slightly smaller than the tube and just made it a snug fit so I can easily remove the model. The base was primed with grey Tamiya Surface Primer. I preshaded it with Vallejo Model Air Black and used Tamiya Light Grey (XF-66) as the base color. After I sealed it with Future, I applied MIG Dark Wash (enamel) to the panel lines and crevasses and then cleaned up the excess with odorless spirits. Then everything was sealed with matte varnish. Thomas, This looks great! The wing (black) panels appear to have a shimmering effect. Is this just lighting or did you paint the shimmering effect on? If so what paint did you use? Yes I did! After priming the panels, I mixed Vallejo Model Air Black with Vallejo Model Air Arctic Blue (metallic) at a 5:1 ratio. This gave the panels a faint metallic sheen and a bluish tint to match the cool colors of the ship. Thomas. Very kind of you to take the time to reply really appreciate it. 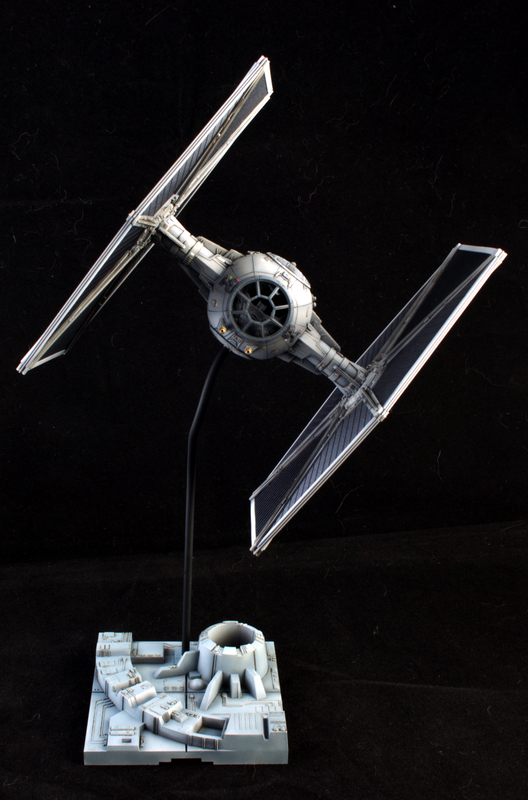 I've completed a Bandai TIE and TIE Advanced. I did a straight build and hand painted the darker grey bits (canopy, etc) with Vallejo acrylic and it came out great. I bought a tube of Starship Filth and want to bring out the detail. I'm not sure what approach to take. I was thinking rattle can clear coat but not sure if I should use gloss, semi or matte. Then wasn't sure if I should gunk wash, thin the paint and try a filter type wash or maybe try s pin wash? Any tips? I'm willing to try any technique. Thanks again. 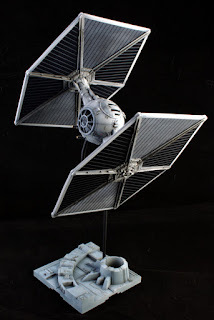 I would say to go with a gloss coat when using oil washes and to go for making a pin wash on the TIEs since they typically have an overall cleaner look compared to something like an X-wing. Thanks so much Thomas! When the time comes if it's okay with you I'll link a picture here. 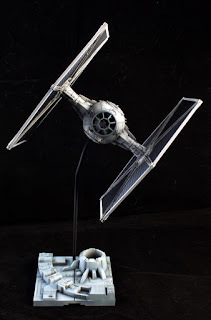 Out of curiosity if I was setting forth to weather an x-wing model with oil paints that was bare plastic with decals and minor hand painted parts would you recommend a matte clear coat instead since the x-wing is much dirtier? Wondered if the gloss coat recommendation on the TIE was related to how clean they are versus an x-wing. I would still use gloss just because it's easier to work with if you are doing oil washes. If you are using the oils to discolor individual panels, you'll need a matte finish. I don't know how I missed this comment, but I just saw your post on Keeper of the Force! Your TIEs turned out great! Which size brass rod do you recommend for the bandai star wars kits, when building custom bases?